What would you prefer on a late afternoon or an evening of a scorching hot day? Ice tea, chilled juice, chilled beer hmm 🙂 , or perhaps something with vitamins and healthy.. like a smoothie… yummmm. One such hot evening, two men in my house were craving for something to drink, something sweet and chilled. The drink which came into my mind immediately was a smoothie, but the only fruits I had at hand were bananas and strawberries. And the only way I can make my men have the fruits they don’t entertain is in the liquid form. Halve the strawberries, removing the green tops. 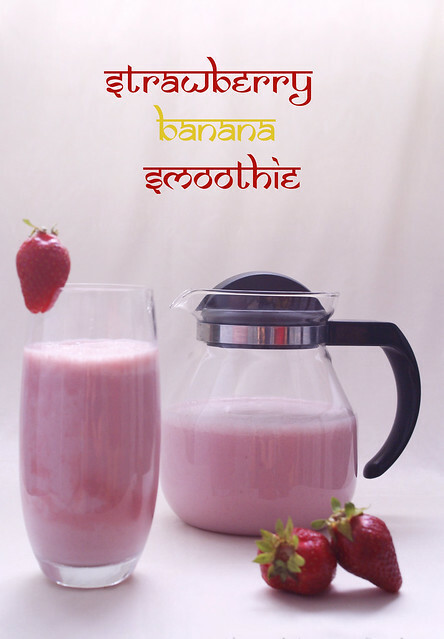 Cut the banana and put both fruits into the blender, add milk and sugar and honey(if using), and blend till smooth. Absolutely yummy, healthy and cooling. Sugar and Honey are for people with an extra sweet tooth, like us. For a more healthy recipe skip them both, or skip sugar and add just the honey. You can also sieve it before serving, it depends on how you prefer. You can also make it with Yogurt. 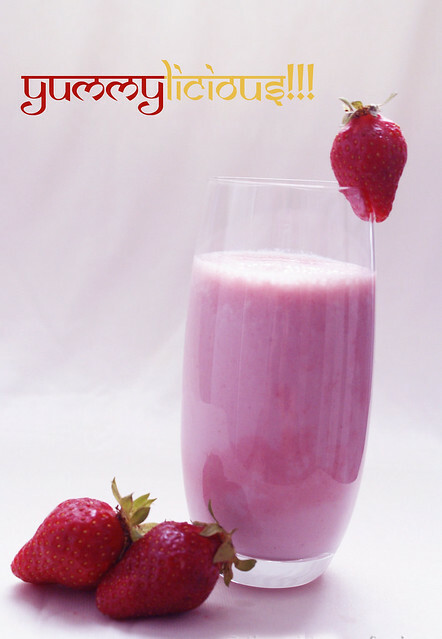 New follower, this recipe looks so refreshing. Great way to beat the heat.